Virginia’s coastal plain, the relatively flat area in the eastern part of the state, consists of a series of materials that were deposited in thin sheets, one on top of another. At the Calvert Cliffs, these layers are exposed. In particular, the sediments deposited during the Miocene Era are exposed in the cliffs. Scientists have proof that during the middle of the Miocene Epoch, 3 to 10 million years ago, a considerable portion of the present Tidewater area was submerged under water. During that time, the area was tropical. Coral, porpoises, sharks, whales, crocodiles, giant barnacles, and many types of shell fishes thrived in those tropical waters. As they died, they settled to the bottom and their remains were gradually covered up by silt. Ages passed and upheavals caused the floor of the sea to be thrust above the surface, creating the cliffs we see today and exposing layers of fossilized remains. For a distance of 35 miles, from Chesapeake Beach to Drum Point, there is an almost unbroken exposure of fossil laden strata. In some places, the cliffs rise to a height of more than 100 feet. Beachcombers in the Calvert Cliffs area can easily find fossils from the Miocene Epoch. Fossils to be found include shark’s teeth, fossil coral and giant barnacles, fossil clams, scallop shells, and mass formations with the impressions of many fossil seashells. One of the greatest finds at the cliffs occurred in 1929 when a 7 foot long whale scull was found near Governors Run. 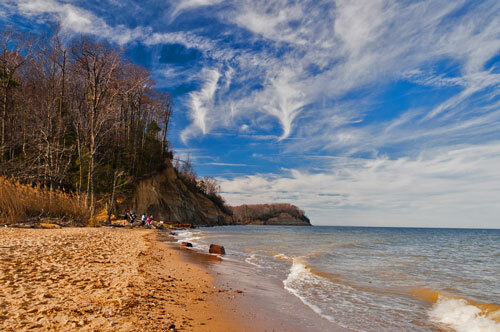 Two popular spots for visitor access to the Calvert Cliffs are the Calvert Cliffs State Park and the Matoaka Beach Cabins. The State Park is a 1,313 acre wooded area, open from sunrise to sunset, with picnic areas, fishing, swimming, and an unpaved, two mile trail leading to beach access for fossil hunting. Matoaka Beach Cabins in St. Leonard, Maryland, was a girls camp from 1924 to 1956. The current owners rent out the cabins. The 50 acre camp includes a vineyard, hiking trails, and a half-mile beachfront for fossil hunting, swimming, crabbing, and boating. The beach is open all year. The beach access fee is $3 for adults and $2 for children under 12. The beach is an easy hike from the parking area. To hunt for fossils, wear boots and take along a small trowel and sieve. Zippered plastic bags, buckets and empty film canisters are handy for safely holding your finds. A word of caution: Do Not, under any circumstances, climb on the cliffs. They are unstable and prone to collapse.